I am international human rights counsel for Church of Scientology International. I am writing about the documentary on Scientology Alex Gibney has done using Lawrence Wright’s book as a foundation. I am writing specifically regarding the salient section in Mr. Wright’s book concerning Scientology in Germany, a subject I am very familiar with. As with every other aspect of the book, Mr. Wright’s revisionist history regarding Germany and Scientology presents a distorted and false picture of the facts that is fatally flawed and does not remotely comport with reality. What separated these groups from Scientology was their orientation toward apocalypse and their yearning for the end-time. That has never been a feature of Scientology. Clearly, however, the lure of totalistic religious movements defies easy categorization. Such groups can arise anywhere and spread like viruses, and it is impossible to know which ones will turn lethal, or why. This is the classic language of extreme bias. The late Bryan Wilson, Emeritus Fellow, University of Oxford and the foremost academic authority on NRMs, identified this lumping together of diverse groups by the media as the epitome of religious intolerance. Scholars in the field unanimously emphasize the diversity of these new movements, most of which have in common only the contemporaneity of their emergence. Yet, what is apparent is a tendency, evident in the media…for all NRMs to be lumped together as if they conformed to one particular stereotype. That this disposition is in itself inimical to the fair treatment of new religions must be apparent. 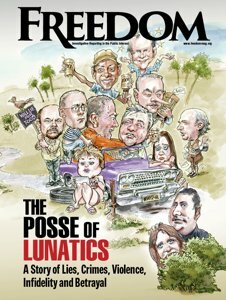 This knee-jerk categorization of Scientology with these destructive cults, accompanied by a strong note of warning against the risk of similar destructive events spreading to Germany and other countries is not only prejudiced – it also feeds directly into public fear and ignorance on the subject. But worst of all is Mr. Wright’s referring to Scientology as spreading like a “virus” which may “turn lethal.” This is shocking language, amounting to hate speech and evidencing malice. There is of course only one thing to do against a lethal virus: eradicate it. This precise analogy of a “mutating virus” has been used by anti-religious extremists in France to advocate stamping out the “pathology of belief” in Europe. This is the language of pure prejudice. The language and methodology of prejudice uses pejorative and provocative terms to disparage and to strike fear in the public as a substitute for reflective analysis. For you to emulate these fatal flaws in your documentary would demonstrate comparable bias and malice. In supporting Germany’s tactics targeting Scientology, Mr. Wright does not accurately portray the depth of discrimination that existed against Scientologists in the early 1990s. Worse, he completely ignores the outcry against these human rights violations that occurred throughout the world by international bodies, academics, officials from other governments and the human rights community condemning Germany for engaging in this discrimination. During the 1990s, the time period that Wright focuses on, the German government engaged in a systematic and egregious policy and practice of religious discrimination against Scientologists in Germany. Federal and state officials urged the public to blacklist and boycott Scientologists from every aspect of German life. This resulted in widespread and systematic discrimination against the Church of Scientology and individuals identified as Scientology parishioners. These officials fueled this climate of hate by publicly urging and implementing a Scientology litmus test to exclude, isolate and ostracize Scientologists from every facet of society simply because of their personal opinions and beliefs. Scientologists in Germany were routinely dismissed from jobs, dismissed from schools, dismissed from political parties, dismissed from social, business and political organizations, denied the right to professional licenses, denied the right to perform their art, denied the right to open bank accounts and obtain loans, denied the right to use public facilities and concert halls. The Church documented more than 1,500 cases of discrimination against its parishioners in Germany during this period and presented the evidence to international human rights bodies, governments and the human rights community. This information was compelling enough to convince the U.S. State Department, the U.S. Trade Representative, the U.S. Commission for Security and Cooperation in Europe, a U.S. Immigration Judge, many U.S. Senators and Congressmen, the United Nations Special Rapporteur on Religious Freedom, the United Nations Human Rights Committee, the Human Rights Centre of Essex University, England, an ad hoc Committee of British Lords and scholars, many NGOs, interfaith groups, human rights groups and independent researchers to condemn Germany for engaging in systematic religious discrimination targeting the Church of Scientology and its parishioners. In November 1996, the United Nations Human Rights Committee determined that actions taken by the Bavarian government to exclude Scientologists from public service employment violated Germany’s international human rights obligations under the International Covenant on Civil and Political Rights. Following a visit to Germany in 1998, the United Nations Special Rapporteur on Religious Freedom issued a report in which he found that a climate of religious intolerance affected Mormons, Muslims, Scientologists, Jehovah’s Witnesses, Baha’is, Charismatic Christians and members of the Hare Krishna movement. In Germany, democracy is used as an ideology to impose conformity. It has been dismaying to discover that the state, and some of its politicians and people, is using what are known from the past to be well-worn paths of discrimination and intolerance and of inciting of intolerance towards a new religious minority, the Scientologists. Business firms whose owners or executives belong to the Church of Scientology may face boycotts and discrimination, sometimes with governmental approval. A particularly egregious form of discrimination in Germany is the use of written declarations chillingly called “sect filters” that require an individual or company to disavow any association with Scientology as a precondition for employment or contractual relations with the government. German government officials have used such declarations to blacklist and boycott Scientologists from public and private employment and to deny Scientologists the right to contract with the government and the private sector. Artists have been prevented from performing or displaying their works because of their Scientology membership. In March 1997, a secret order of the Federal Labor Office was exposed requiring all government Labor Offices to mark businesses which were suspected to be owned by Scientologists with an “S” in computer files to identify the religious affiliation of individuals who own such businesses in order to blacklist them for their religious beliefs. Many private job centers also adopted this practice. Scientologists continued to take such grievances to court, and the courts frequently ruled in their favor. In 1993, the U.S. Commission on Security and Cooperation in Europe issued a report denouncing the boycotting of world renowned pianist, Chick Corea, from a government sponsored jazz concert and the widespread discrimination by German officials targeting Scientologists simply due to their religious association and beliefs. The discrimination was so egregious that in 1997, hearings were held in the United States Senate detailing the state of religious intolerance against Scientologists in Germany. The evidence that the discrimination amounted to serious human rights abuses against German Scientologists was so unequivocal that, in 1997, a United States Immigration Judge granted a German Scientologist religious asylum in the United States on the grounds she would be subject to religious persecution if she returned to Germany. Yet, in embracing Germany’s justification for its pattern and practice of human rights abuses directed at Scientologists, Mr. Wright totally disregards this widespread international condemnation of religious intolerance in Germany – it just did not comport with his preconceived anti-Scientology agenda. On page 242 of his book, Mr. Wright relies on a quote by Ursula Caberta, who he identifies as a “head of the Hamburg anti-Scientology task force,” to make an outrageous comparison between L. Ron Hubbard’s religious text on morals and ethics, Introduction to Scientology Ethics, and Mein Kampf, as though the two books were the same philosophy. Mr. Wright fails to mention that Hamburg closed down the much criticized Scientology Working Group in 2010 and removed Mrs. Caberta from her post; she resigned from the government a few years later. 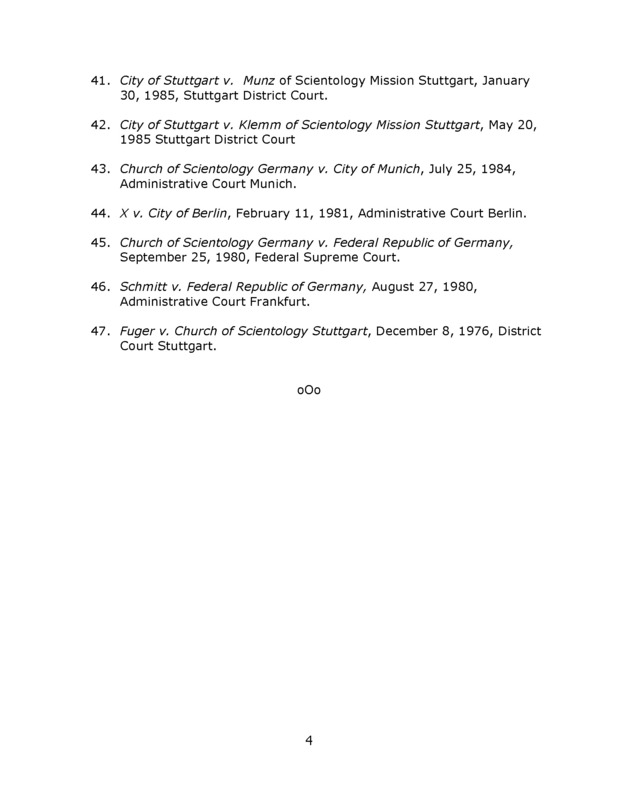 Mr. Wright also conveniently ignores that: 1) Mrs. Caberta was condemned by a German Court for making false statements regarding Scientology; 2) was sanctioned by German Courts for disseminating the odious Scientology “sect filter;” 3) was found by a German Court to have engaged in illegal activities against Scientologists in violation of human rights conventions; 4) was identified as engaging in systematic discrimination against Scientologists in State Department Reports; and 5) was roundly condemned and fined by a Court in Germany for violating her duty of neutrality by accepting $75,000 from an American engaged in anti-Scientology activities. The principle of neutrality and tolerance has been violated by the opponent by giving non-objective opinions about the doctrine of the applicant. … The opponent’s restriction of the fundamental right of the applicant per article 4, subsection 1 and 2 is illegal. Contempt of the German Constitution, violation of Human Rights Conventions, violation of state neutrality, abuse of office, violation of the data protection law and illegal calls for boycott. In 2000, a German Scientologist living and working in the United States filed suit against Caberta after he was presented with a “sect filter” form (placed on line by her office for businesses to use) by a German company during contract negotiations. In a subsequent ruling by the U.S. federal court in Tampa, Florida, Magistrate Judge Elizabeth Jenkins condemned Caberta's behavior throughout the litigation as “evasive,” “unresponsive,” “uncooperative,” and “argumentative,” and sanctioned her for non-compliance with court orders. The State Department has criticized Mrs. Caberta for human rights abuses against American citizens. She is the “sect commissioner” referred to in the State Department Human Rights Report for 2000 who publicly claimed that Microsoft’s Windows 2000 contained a “Trojan Horse” or “back door” that would permit the Church of Scientology to obtain information from an unsuspecting user’s system. Microsoft allowed the German Federal Office for Security in Information Technology (BSI) to investigate the software. The German government conducted various tests but failed to find any evidence of or anything that in any way validated these concerns. In January, the Hamburg Administrative Court ruled for the Church of Scientology Germany and the Church of Scientology Hamburg against the City of Hamburg and the Hamburg Ministry of Interior. In a public decision, the court issued a preliminary injunction prohibiting the Interior Ministry from allowing Ursula Caberta, head of the Ministry’s “Working Group Scientology,” from repeating certain public statements of a false and derogatory character about the Church. The court criticized the Interior Ministry for its failure to reprimand Caberta for violating her duty of neutrality as a government employee by accepting a personal loan of $75,000 (approximately 66,250 euros) with no terms of repayment from a private individual funding anti-Scientology litigation. An earlier criminal investigation into this matter resulted in Caberta being fined approximately $8,490 (7,500 euros) in June 2002; however, the Hamburg Interior Ministry made no requirement that she pay back the $75,000 loan. In March 2004 the United States District Court in Tampa, Florida, ordered Caberta to pay $5,249.50 to a U.S. Scientologist to recover his expenses when Caberta failed to show up to testify in his case against her. In June 2004, the Hamburg Administrative Court issued a permanent injunction against Caberta’s Ministry of the Interior working group for false statements regarding Scientology contained in the book Maze of Illusions. On 15 December 2005, the Federal Administrative Supreme Court in Leipzig ruled against the City of Hamburg and determined that the use of any “sect filter” constitutes an unconstitutional interference with freedom of religion as such government interference has no basis in law whatsoever and is illegal. In February, 2006, Caberta sought to subvert this decision by posting a copy of the sect filter on the Internet with her description of the case. In June 2006, the Hamburg Administrative Court ruled that this was a violation of the Supreme Court’s ruling and ordered the City to remove Caberta’s posting. On April 25, 2007, the Hamburg Court ordered the City of Hamburg to stop Caberta repeating three false accusations she had been making about the Hamburg Scientology Church. All of this information evidencing Mrs. Caberta’s motives, illegalities and bias was omitted by Mr. Wright and provided a completely false and distorted picture of the Church and the conflict that existed at that time. 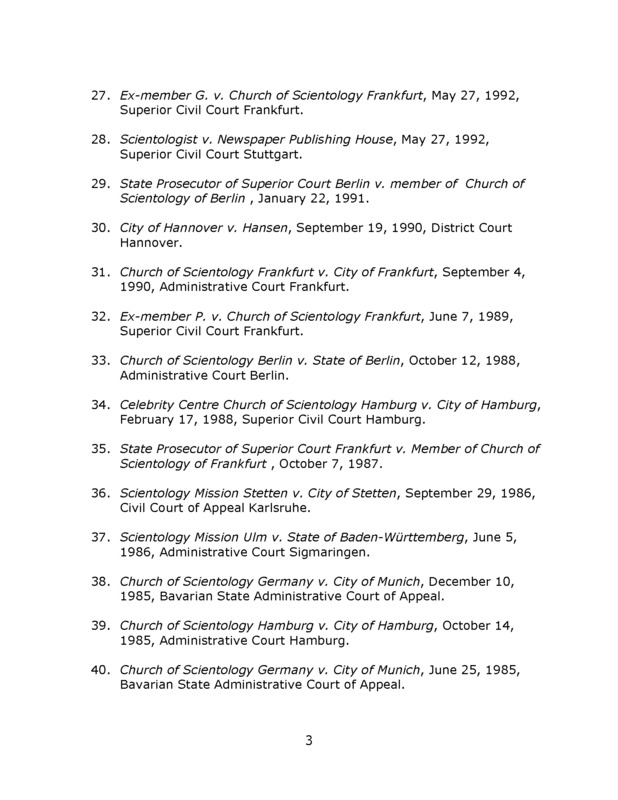 While giving the reader the distinct impression that Scientology Churches are treated as commercial organizations in Germany, Mr. Wright fails to mention that there are over 40 German judicial decisions recognizing that the Church of Scientology and its members are entitled to the protections of freedom of religion and belief granted in Article 4 of the German Constitution. An idealistic association in Germany is one which forwards a non-commercial purpose, working for the society in the same way that a charitable or religious organization does. German courts have thoroughly examined the Church’s fundraising practices, activities and purpose and have reached the unequivocal determination that it serves religious or philosophical aims protected by the German Constitution. A few of these decisions are summarized below. The German Federal Administrative Court issued a landmark decision in 1997 regarding the Church of Scientology’s idealistic nature that set an important precedent. The Federal Administrative Court not only recognized the religious character of Scientology; it also noted that the Church of Scientology was an idealistic association serving religious and not commercial purposes. The Administrative Court has decided that an idealistic association does not conduct a commercial activity to the extent that it offers services to its members by the means of which the membership is realized and that cannot be provided by other service providers independent of the membership relationship. For, in such circumstances, no commercial activity of an entrepreneur does exist. 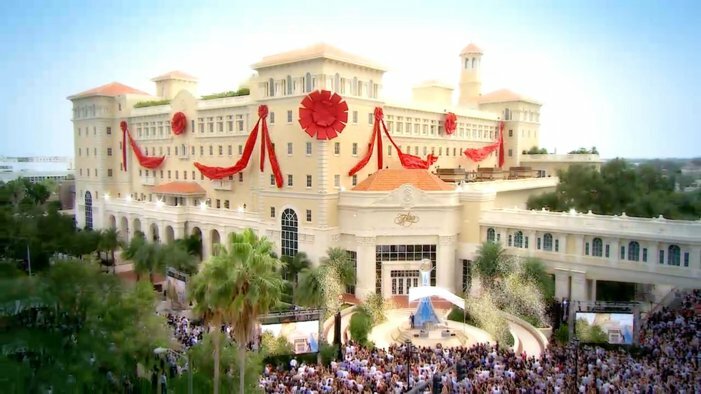 In October 2002, the Federal Labor Court ruled that staff members who work in a Church of Scientology are motivated by idealistic and spiritual aims. In reaching its decision, the Court relied on the landmark 1997 decision by the German Federal Supreme Administrative Court finding that Scientology’s religious practices are intended for spiritual gain and serve a religious purpose. Thus it has been established that the plaintiff not only professes alone for herself a personal, individual, religious or philosophic belief, but shares this in community with others and thereby obtains the protection of Article 4 [freedom of religion or belief] of the Constitution. According to Article 4, section 1 of the German Constitution, freedom of belief and of conscience and the freedom of the religious and philosophical denomination are inviolable. The plaintiff, for her practice as a Scientologist, can claim the protection of the religious or philosophical denomination according to Article 4, section 1 of the German Constitution. 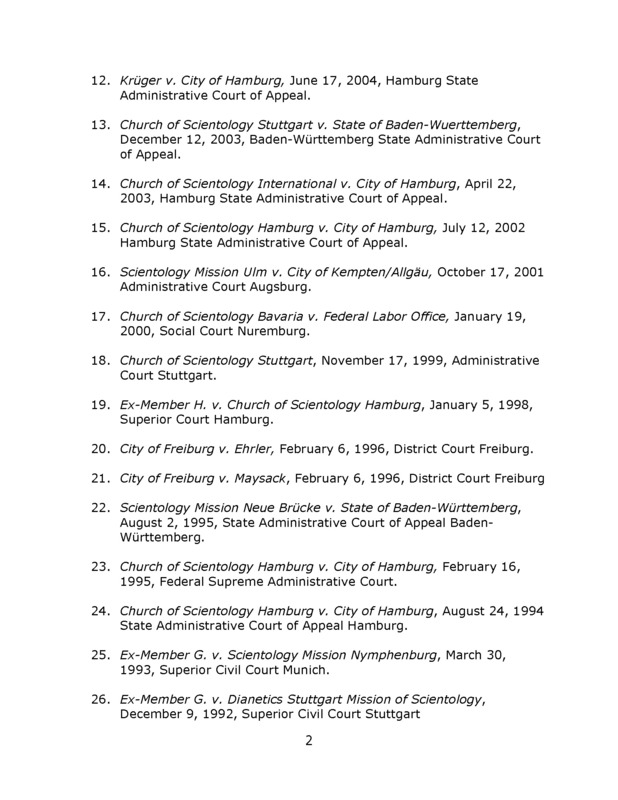 These are just a few of the over 40 decisions by the German Courts (see attached list of cases) upholding the religious rights of the Church of Scientology and its parishioners in Germany. 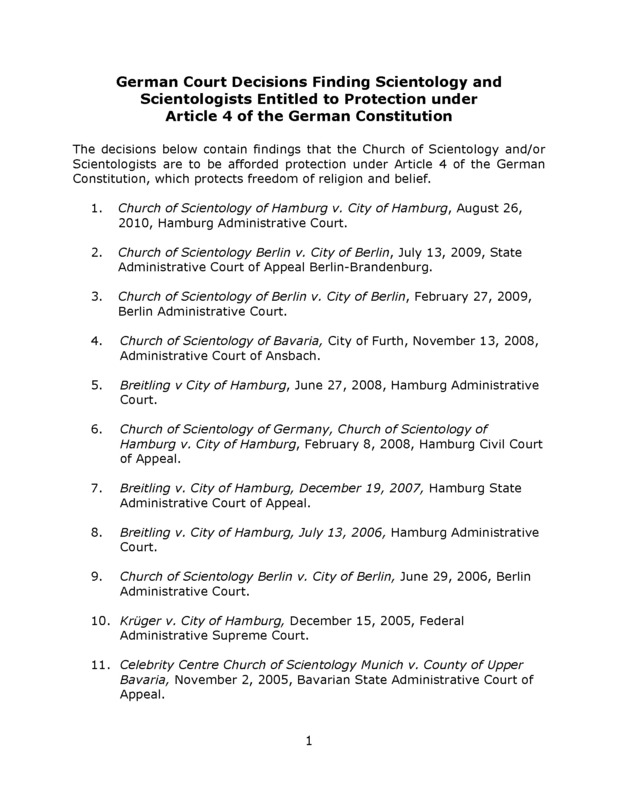 These decisions belie Mr. Wright’s premise that Scientology is not treated as a religion in Germany. Although Mr. Wright’s book was published in 2013, the Germany section might as well have been written twenty years ago. It is hopelessly outdated. 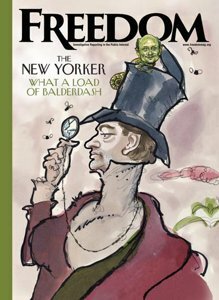 Mr. Wright chose to focus only on the early 1990s when the hysteria against Scientology reached a fever pitch fueled by false accusations from extremist officials led by Mrs. Caberta and Mr. Blum, who were following an illegal agenda in violation of Germany’s human rights obligations. The situation has dramatically changed for the better in the last two decades. Chick Corea regularly performs in Germany to sold-out crowds. The Hamburg Scientology Task Force has been disbanded. German Courts have declared “sect filters” to be illegal and to interfere with a Scientologist’s right to freedom of religion and association. German Courts have enjoined officials and local governments from publishing hate speech regarding Scientology due to the requirement of religious neutrality. The Federal Labor Office agreed in 2005 to cease and desist from branding businesses suspected of being owned by individuals associated with the Church of Scientology with an “S” in computer files for the purpose of blacklisting them. Mrs. Caberta was removed from her post. Mrs. Caberta and Mr. Blum are no longer in government. German Courts agreed that Mrs. Caberta could be labelled as a “human rights violator” by the Church for her actions and outrageous pronouncements. German Courts sanctioned Mrs. Caberta for accepting substantial funds from a rabid anti-Scientologist. German Courts have issued over 40 decisions unequivocally finding that Scientology is a religion, that the Church of Scientology is a non-commercial idealistic organization serving its religious mission, and that the use of “sect-filters” and other discriminatory actions targeting individuals due to their association with the Scientology religion amounts to illegal religious discrimination. Mr. Wright’s section on Germany is not only factually distorted; it is frozen in time in a disingenuous effort to paint the situation in Germany and the Church in a false light. Mr. Wright’s depiction of Germany and Scientology, like the rest of his book, is extremely biased and not worth the paper it is printed on. Likewise, Alex Gibney’s documentary is based upon the same fatal flaws that infect Wright’s book, presenting a false, biased picture of Scientology that amounts to nothing more than pure propaganda. HBO should do the right thing and cancel its broadcast. Dr. Bryan Wilson, Social Change and New Religious Movements, (August 2, 1995). Letter of 6 October 1994 to Mr. Sam Brown, Head of U.S. Delegation, OSCE, from the Chairs of the Congressional Arts Caucus, the Hispanic Caucus, the Human Rights Caucus, and the Black Caucus of the United States Congress. State Department International Religious Freedom Report, 2003, http://www.state.gov/j/drl/rls/irf/2003/24410.htm.